Limited edition of only 495 pieces! Framed canvas print measures 14 1/2-inches tall x 11-inches wide. Interpretive artwork inspired by Star Wars: Episode VI - Return of the Jedi, featuring Boba Fett. 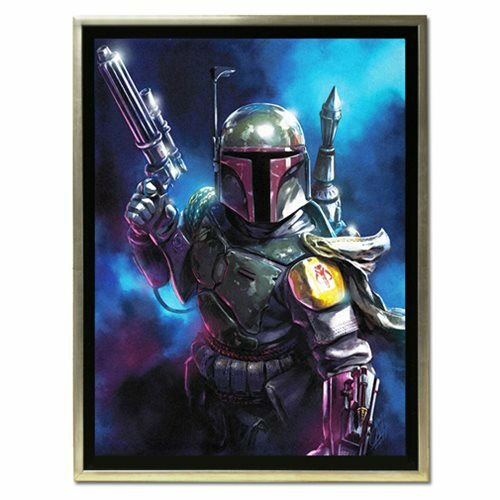 This captivating Star Wars From the Shadows by Santi Casas Framed Canvas Giclee Art Print is a limited edition of only 495 pieces. The marvelous framed giclee on canvas measures about 14 1/2-inches tall x 11-inches wide and the frame measures about 15 4/5-inches tall x 12 2/5-inches wide. Part of the Acme Archives' Gem Collection and comes with a certificate of authenticity.